Please be patient... it may take 1-2 minutes for video to download. 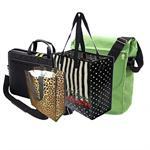 Click to view fashionable totes and other bags all made from recycled plastic bottles. Recycled AND reuseable!